Although it’s easy to forget about the bird table at the back of your garden, by keeping it clean you’ll help keep the birds in your garden healthy and happy. The same goes for hanging bird feeders and bird baths. If you don’t keep bird feeders clean, mouldy seeds and bird droppings can quickly spread disease. Birds like to congregate in these areas – meaning they can easily pass diseases to each other – so keeping this area clean and tidy can play a big part in keeping the birds in your area healthy. This may seem like an obvious one but it’s far easier to minimise mess if you don’t bring your dirty feeder into your house to clean. Simply fill a bowl with warm soapy water and take it outside. Whether you’re cleaning a bird house hanging feeder or bird feeder stand, where possible, completely take it apart to clean it. Make sure you empty out all the seeds whilst also removing the hooks and accessories. With hanging bird feeders, you’ll need to remove the lid, base and tray (you should scrub and soak these separately) as this’ll allow you to clean hard to reach areas. Having the right cleaning tools to hand will make the job a little easier. Wear gloves, and use warm soapy water and a bottle brush to clean all the nooks and crannies where dirt may have got stuck. If using a disinfectant, make sure you clean with one that’s safe for birds like Zoflora’s Concentrated Disinfectant. The feeder should be completely dry before you fill it with seed. This’ll keep it clean for longer and prevent residue and grease from building up. Cleaning your feeder will not only keep the birds healthy, but will also extend the life of your feeder. Preventing damage and stains by keeping on top of the cleaning will also help to hold off rust on metal or wire feeders. 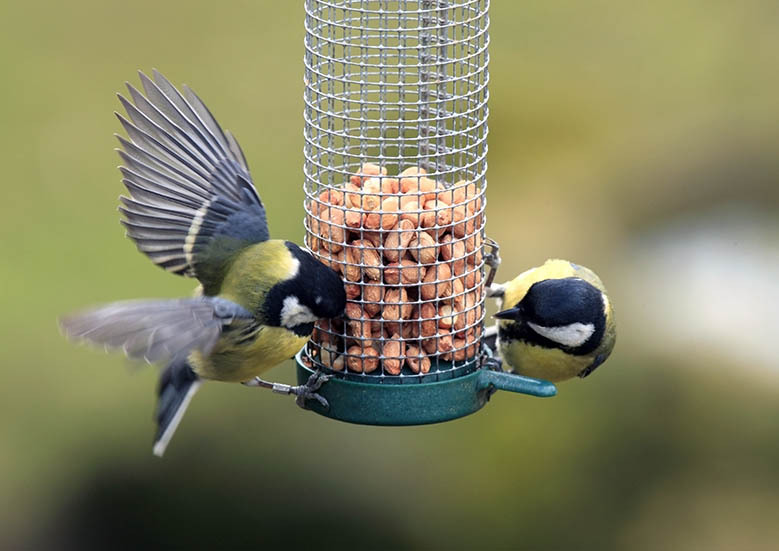 Don’t forget to clean your feeders regularly, to help keep our feathered friends happy. Every 4-6 weeks is ideal, but as often as possible is better when they’re being used often.